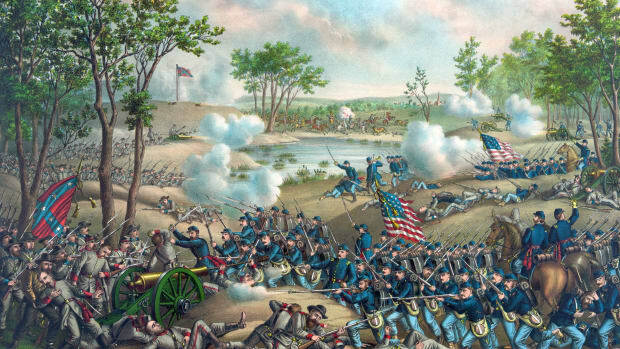 In May 1864, Confederate forces clashed with the advancing Union Army in the Battle of Spotsylvania Court House, which lasted for the better part of two weeks and included some of the bloodiest fighting of the Civil War. After an indecisive battle in the dense Virginia woods known as the Wilderness ended on May 7, Union General Ulysses S. Grant and the Army of the Potomac marched southward, meeting Robert E. Lee’s Army of Northern Virginia once again at the crossroads town of Spotsylvania Court House the next day. Over the 12 days that followed, Union troops briefly broke the Confederate line, but the rebels managed to close the gap and hold their ground. 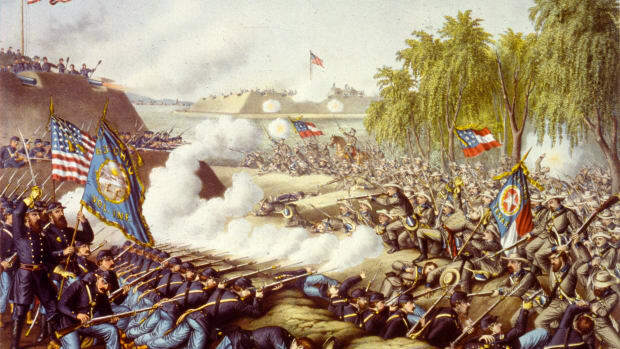 The battle, which cost 18,000 Union and 11,000 Confederate casualties, included nearly 20 hours of brutal hand-to-hand combat at the infamous “Bloody Angle,” a section of the Confederate salient, on May 12-13. On May 21, Grant disengaged his troops and ordered them to continue their march south toward the Confederate capital of Richmond. Appointed general in chief of all Union armies in February 1864, Ulysses S. Grant wasted no time in planning a major offensive on the Confederate capital of Richmond, Virginia. Grant’s primary goal in threatening the capital was to keep Robert E. Lee’s Army of Northern Virginia occupied while Union General William T. Sherman led his own advance into Georgia in the war’s western theater. 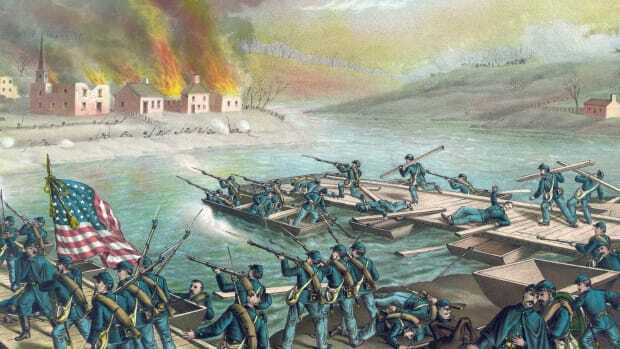 Having observed the Army of the Potomac’s crossing of the Rapidan River on May 4, Lee moved his army into position to confront the enemy in the dense woodland known as the Wilderness, where the first engagement of the Union campaign occurred on May 5-7. Did you know? From May 5 to May 12, 1864, the Army of the Potomac lost around 32,000 men (killed, wounded or missing) in the Battles of the Wilderness and Spotsylvania Court House--more than for all Union armies combined in any previous week of the war. After two days of bloody but indecisive fighting, Grant ordered the Army of the Potomac (led by General George Meade) to march south via a flanking motion in an attempt to get between Lee’s Army of Northern Virginia and Richmond. 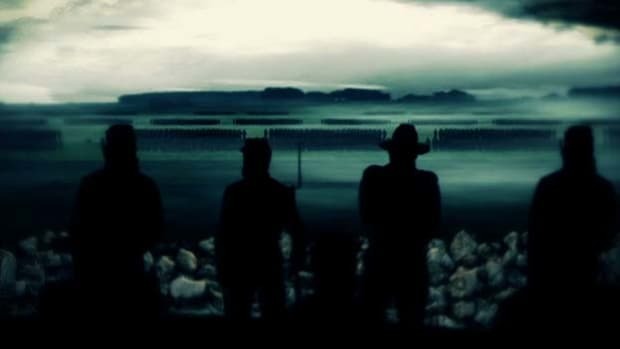 Their destination was the small town of Spotsylvania Court House, a crossroads on the road to Richmond. 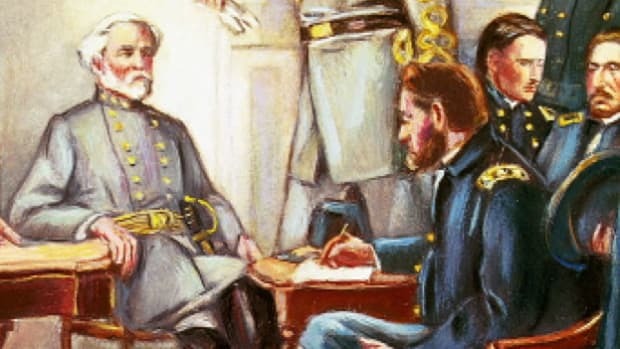 Their movement overnight was slower than had been hoped for, however, and Lee’s Confederates managed to reach the crossroads before the Federals. 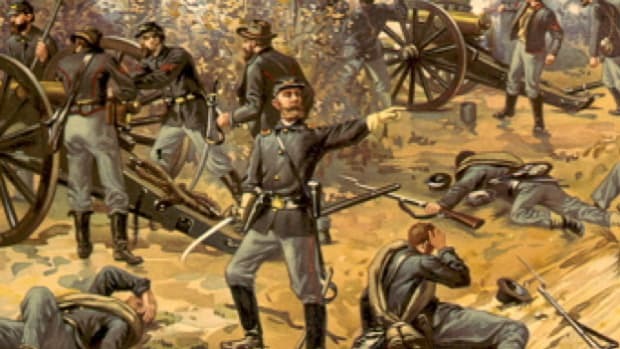 Rushing to build a network of defensive breastworks, trenches and artillery emplacements at Spotsylvania, the rebels stalled the Union advance there beginning on May 8. For the next 12 days, Spotsylvania Court House saw some of the bloodiest fighting of the Civil War, with some 18,000 Union and 11,000 Confederate casualties. On May 9, Grant sent the Army of the Potomac’s 2nd Corps, led by Winfield Scott Hancock, to turn the Confederate left; Lee was able to counter the movement on May 10. That afternoon, five Union divisions attacked the Confederate left-center along a mile-wide front, but Lee had reinforced the line, which held strong. The Confederates had built a huge salient in their lines pointing north toward the Federals; its shape earned it the name “mule shoe.” Though army engineers deemed the salient too vulnerable to attack, Lee felt that the Confederate cannoneers would be able to defend it against Union attacks. Late on May 10, a group of 12 Union regiments led by the 24-year-old Colonel Emory Upton assaulted the mule-shoe salient in a daring charge across 200 yard of open ground. The regiments almost reached the center of the salient before Confederate artillery was able to force them back to their initial positions; Upton received a promotion for his efforts. 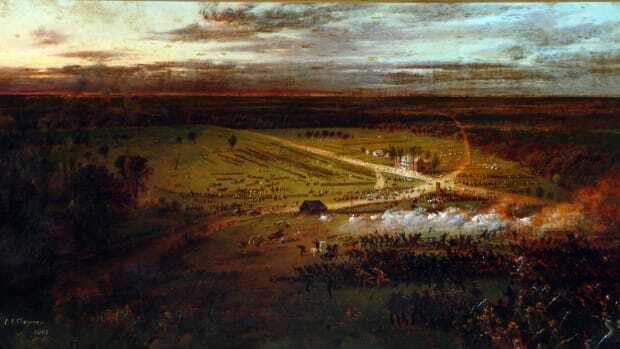 On May 11, during the Battle of Spotsylvania Court House, General J.E.B. Stuart’s famed Confederate cavalry made a stand against advancing Union cavalry at nearby Yellow Tavern, six miles north of Richmond. General Philip Sheridan’s troops, which included a brigade led by General George A. Custer, outnumbered the rebels two to one. After heavy casualties were sustained on both sides, Sheridan’s men pulled out a victory; in an even more crushing loss for the Confederacy, Stuart was mortally wounded in the battle. At dawn on May 12, Hancock’s Union corps attacked the Confederate mule-shoe salient at a section that became known as “Bloody Angle,” capturing most of a rebel division of and nearly splitting Lee’s army in half. 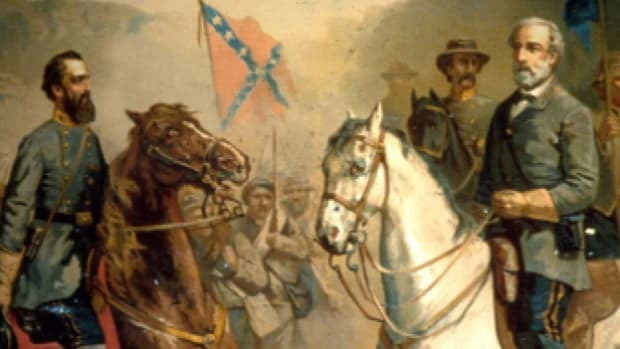 As he had done in the Battle of the Wilderness, General Lee himself tried to lead the rebels in a counterattack, only to be ordered to the rear by his soldiers. Led instead by Georgia brigadier John B. Hood, the counterattack managed to force the bluecoats back. Fighting raged at Bloody Angle for some 20 hours, in possibly the fiercest sustained stretch of combat of the war. Meanwhile, the Union 5th and 9th corps attacked the Confederate left and right, with little success. Late that night, Lee ordered his battered troops to fall back and form a new line a half-mile behind, which had been hastily fortified by Confederate engineers. 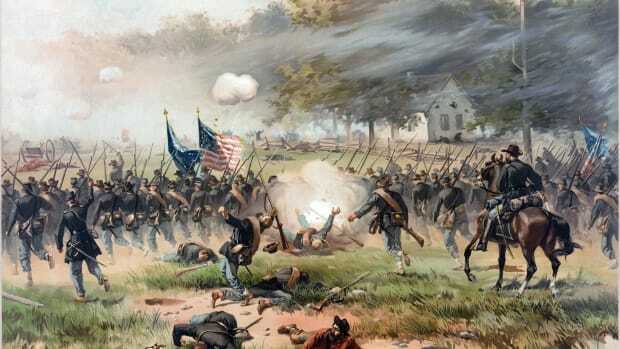 Days of heavy rain followed, as Grant shifted his army to the left and looked for weak points in the Confederate line. An attempted surprise attack on May 18 failed, costing more Union casualties. 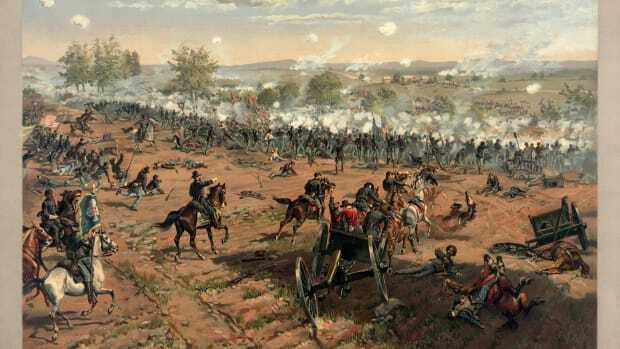 On May 19, the Confederates turned the tables with a flank attack on the Union right at Harris Farm; it was repulsed with heavy losses on both sides. As it became clear to Grant that his troops could not gain an advantage, however, he disengaged his army on May 21 and ordered his men to continue their flanking march southeast toward Richmond. 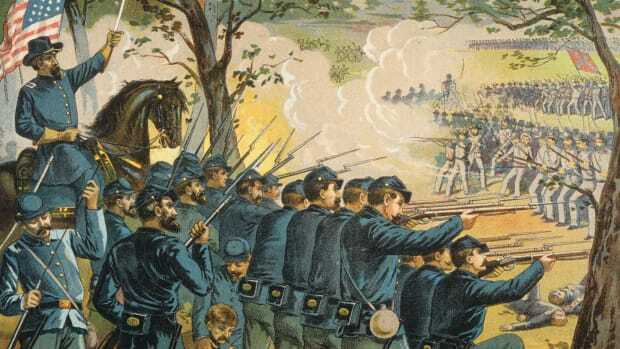 Before the attack on Bloody Angle, Grant had famously sent a cable to Washington stating his intention to “fight it out on this line if it takes all summer.” In the North, alarmingly high casualty reports dashed the war-weary public’s feverishly high hopes as it became clear that Union troops had failed to break the Confederate line. Despite the cost, however, Grant’s relentless advance continued: As the Union Army headed for Cold Harbor, another crossroads town located near the battlefield at Gaines’ Mill (site of one of the Seven Days’ battles of 1862), Lee was forced yet again to maneuver his army in between the enemy and the Confederate capital.